I heared you don't have models for archeologists building and it just general houses. I may try make vanilla daggerfall style building that still be different from others if you interested. Like this thing I started. Modelling in daggerfall style not that hard. However I has no idea what I'am doing and how to port it into game, but I trying to follow way of original models did - where every plane with different texture is separate object. 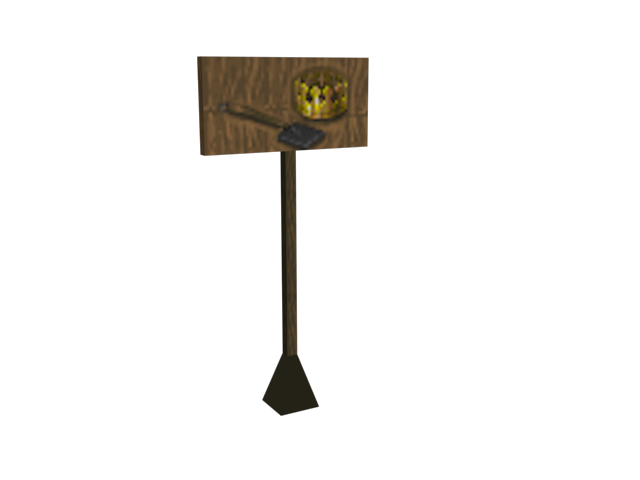 Here how this new texture may look on standart sign model, I hope it looks enough vanilla style and such thing may help indicate archeological guild buildings for players. For my sign I just edited vanilla sprites to maximum fit style and way original game signs was crated, so people who play vanilla game will not feel any inconsistenty. Your sighns may be nice for people who use retextured HD version. Building is just very speedy example. If authors of mod agree and if I reciver help of people who can properly import things in game and make them work - I can try make and new buildings models for guild, and new interior models and new vanilla-like textures. This is STILL working for me, same guy, about 12 to 15 different builds, over about a three or four month ( maybe five?) Period. Still going up in rank, still getting those things, and the Guild houses still show up all over the place like they're supposed to. "This here is what's known as a Company Town. We don't *like* Mage's Guild around these parts..."